Avril Lavigne is the North-American singer whose songs “Complicated,” “Sk8er Boi,” “I’m With You,” “My Happy Ending,” and “Girlfriend” topped world’s charts and brought her fame. The singer works in the genre of alternative rock, pop-punk, pop-rock, and post-grunge. Avril Lavigne was born at the end of September 1984 in a provincial Canadian town. Her parents Judith-Rosanne and Jean-Claude were Christians. It was the French-Canadian father who gave his daughter the name “Avril”; this name can be translated as “April.” The singer has some Ukrainian roots: her grand grandfather was a white-guardian officer from Odessa who migrated halfway around the world. Avril has an elder brother Matthew and a younger sister Michelle. The girl started singing at church at two; she was also engaged in music at home when her loving parents bought musical instruments for her: drums, a microphone, a keyboard, and a guitar. Avril made a real music studio. She dived into music and had many offers; she often sang country songs at the town fairs. Apart from music, she played soccer and basketball and skateboarded. Avril’s professional career developed quickly. At the age of 14, she won a contest and went to Ottawa where she sang in a duo with Shania Twain. The manager Cliff Fabri noticed the talented youth and persuaded her to send her recording to producing centers. This step led to success: 16-year-old Lavigne was invited to the United States. The young woman quitted her studies (she never liked going to school) and moved to New York. After the first audition, Avril Lavigne signed the contract with Arista Records; the sum of the agreement exceeded $1 million. The producer paid the generous advance payment for two albums. The first one, Let Go, broke all records possible: the second position in the Billboard 200, top positions in Canadian, British, and Australian charts. In several months, the album became platinum four times in the US. Besides, there were many prizes for the debuting song “Complicated”: MTV, the World Music Awards, Grammy, and the Canadian Juno Award. The music video for this hit had 231 million views; the official website of the singer was created. The second album Under My Skin (2004) was equally successful. 8 million copies were sold; the audience loved the hits “Don’t Tell Me,” “My Happy Ending,” “Nobody’s Home,” and “He Wasn’t.” The singer won the World Music Award and Juno Award again and went touring over the world for two years. That year, she also appeared on the cover of Maxim. In 2007, Avril had the third album The Best Damn Thing released; again, it was welcomed by listeners. According to Forbes, Avril Lavigne was among the richest young people in the world. At the same time, the scandal broke out: the artist was accused of plagiarism; the young woman went to court and won. Still, critics marked the entrance of Avril’s work was similar to the song of the Canadian singer Peaches. Lavigne did not limit herself to music only. She created the comics “Make 5 Wishes” and participated in the movies Sabrina the Teenage Witch, Going the Distance, Fast Food Nation, Over the Hedge, and The Flock. In one of her interviews, the woman said she would like to appear in a Christmas comedy one day. Avril created her own fashion line for teens “Abbey Dawn” and perfumes “Black Star” and “Forbidden Rose.” Besides, she wrote the soundtrack for Alice in Wonderland. The singer owns the electro guitar brand “Fender.” She has founded many charity organizations. In 2012, Avril and the bodacious rock singer Marilyn Manson were often seen together. Rumors had it the stars carried on an affair, but it was only a PR stunt. Actually, the musicians created the song “Bad Girl” together; it was included in Avril’s fifth album Avril Lavigne (2013). “Here’s to Never Growing Up,” “Rock N Roll,” and “Let Me Go” were the singles of the album. From that time, the artist stopped presenting albums for a while. In 2014, the famous hacker attack on iCloud happened: celebrities’ personal files were stolen. Young Avril was one of the victims; however, there was nothing shameful in those photos: the woman did not take pictures naked. In the course of time, the artist changed her image. Avril was not tall and posed as a street teen and a skateboarder. Gradually, her style became gothic: she preferred black and pink clothes and hyperbolized makeup. After the album The Best Damn Thing came out, the audience watched the new blonde with a cute face; she often wore no makeup. Avril practices yoga and meditation; she is a vegetarian. Her height is 155 cm., and her weight is about 49-52 kg. Some fans believe there are Avril’s doppelgangers in Russia. The singer Yulia Savicheva who represented Russia on Eurovision-2004 is often called the Russian Avril Lavigne. There are many photos where Yulia looks like her Canadian colleague; in addition, their voices are somehow similar. Besides, the young Russian actress Liza Arzamasova bears some resemblance to Lavigne: the shape of her eyes and lips is close to those of Lavigne’s. Fans follow the events of the singer’s life enthusiastically. 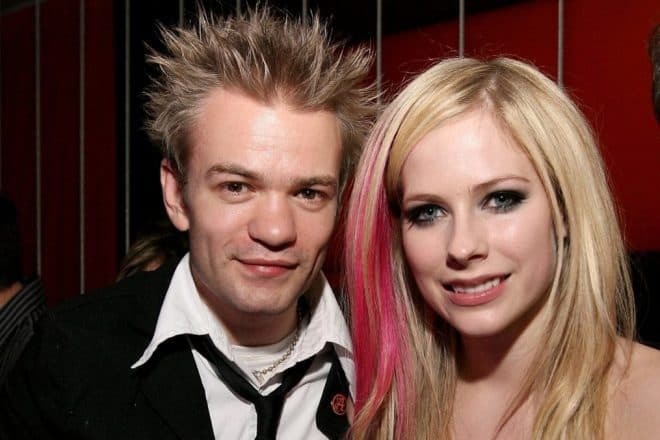 The musician Deryck Whibley was Avril’s first boyfriend; they met in 2001 and married in 2006. The young man made a romantic proposal: they went to Italy on vacation, and Deryck proposed Avril on a picnic. In spite of the artists’ rebellious stage image, the wedding ceremony was traditional. Three years later, the couple split up. After the failed marriage, the artist began to see Brody Jenner, the former reality-show participant. To celebrate their love, the couple had the tattoos with each other’s names. Still, the couple split up: while Avril dreamed of having kids, her boyfriend was childfree. In 2012, the singer was noticed with Chad Kroeger, the Canadian rock-group member. Soon, they married; in the pictures of that period, Avril was probably pregnant. Nevertheless, it is still unknown whether the woman had the child; she did not give any comments. Three years later, the young people divorced. In 2014-2015, the actress did not appear in public. Many rumors followed: drug dependence, mental disorders, even the theories about her death. The latter speculation was based on fans’ ideas that Lavigne’s doppelganger Melissa Vandella replaced Avril. Those who believed in the conspiracy theory claimed there were no distinguishing moles on the photos from 2004. They said Avril Lavigne had committed suicide in the early 2000s, but producers continued to promote her. In fact, the singer disappeared in 2014 because of a sudden disease. In spring, the woman felt sick: she was always sleepy, lost much weight, and suffered from headaches. Doctors could not understand what caused that condition and believed it was depression or chronic fatigue syndrome. Six months later, they managed to make the right diagnosis: Lyme disease, or brain inflammation. After the treatment, Avril Lavigne came back and started working on her solo project. After the recovery, the woman gave the first interview in Good Morning America. According to the singer, she concluded she had a virus disease on her own. This interview also appeared on Avril’s Instagram and Twitter pages. After Avril Lavigne and Chad Kroeger divorced, the woman did not spend much time alone. In 2015, she often appeared with the musician Ryan Cabrera, but the relationship stopped in 2016. The next year, the artist was seeing the record producer Jonathan Rotem; the couple frequently visited social events together, but no marriage followed. 2018 brought the singer the meeting with Phillip Sarofim, the son of the billionaire Fayez Sarofim. Paparazzi took the photos of the young people when they were on vacation in Italy. The lovers look happy; today, Avril and Philipp spend all the time together. In 2017, Avril was working on the material for the new album with the working title I’m A Warrior and collaborated with the Japanese group One Ok Rock in recording its album. The singer characterized the sixth album as “raw” but powerful. In Twitter comments, she called it the emotional traveling.